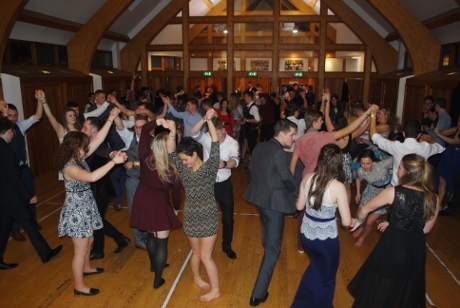 For the past couple of years we have played a ceilidh for the students of Cumbria University at Ambleside (what was Charlotte Mason College) and this year they asked us back again. 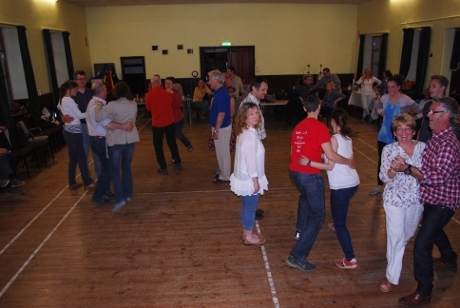 In the new(ish) parish hall, everyone had a lively and boisterous evening. Thanks to Sally and her team. I very much appreciated the bands patience throughout the evening. This is my final year at the university, but I will pass your details on to the next organiser if there is one. Thank you again for your time, patience, and as always, great music! The year ended on a sad note when one of the original members passed away. 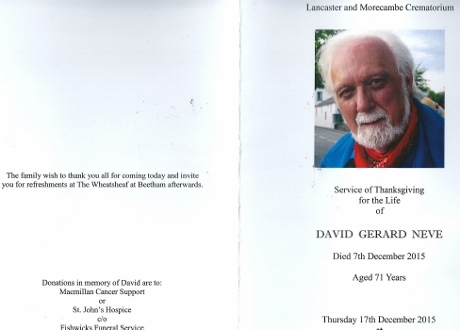 Dave was with us at the very beginning when the Brewery Folk Club started in 1973 (more) and he will be sadly missed by all his many friends. 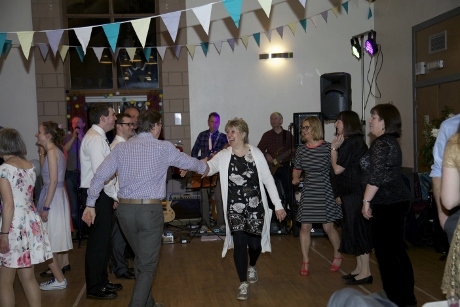 We occasionally support charitable events, and the latest one was a ceilidh raising money for MIND. Held in the Castle Street Centre in Kendal, the evening was well supported and raised over £1,100, a remarkable amount especially given the wet weather on the evening. The band thoroughly enjoyed themselves, and it was great to see so many friends attending. I just want to thank you - and the rest of Tumbling Tom - again for the wonderful music and FUN you provided on Saturday night! It was a superb night - I danced at least five dances in amongst doing other things and felt it was just what I, and I'm sure others too - needed after the dreadful things that had gone on in Paris and elsewhere so recently. To raise that amount of money was absolutely wonderful and an enormous help in keeping South Lakeland Mind solvent and functioning - no small task these days for small but very important charities! 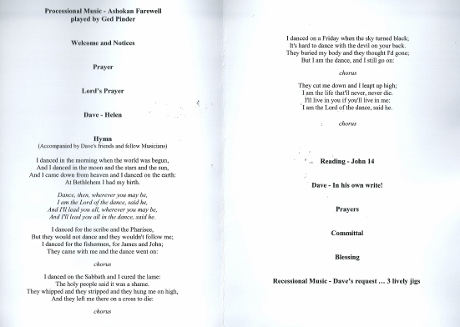 Would you pass on my thanks to everyone and tell them all how very much we appreciated Tumbling Tom's music and generosity in playing for free - and for coming out on such an awful night. We were most impressed how many people turned out too - we had expected more to be put off by the dire warnings so it was a joy to see at least 80-90% there. 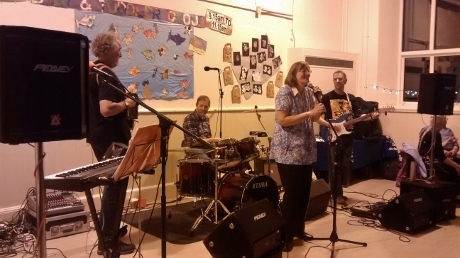 I just wanted to send huge THANK YOU from everyone at South Lakeland Mind for playing for us on Saturday night. It was more than kind of you not to charge us, and to help us raise a sum that was beyond our expectations. I have a had a lot of comments saying what a great atmosphere there was, all down to your wonderful music and lovely callers! We were wondering how it would go, as we haven't held one before, but will definitely be making it an annual event. Thanks to Judith Moore for the two photos below. 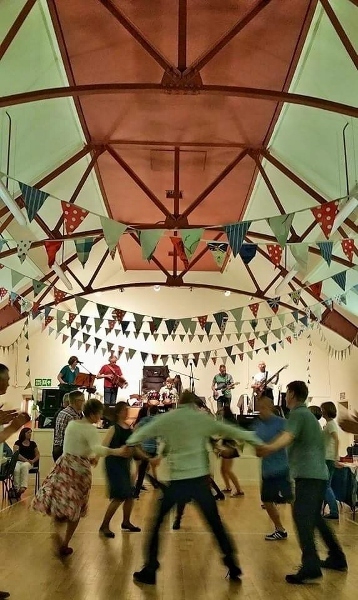 The band are very pleased to have been asked to play at the Crook Morris Christmas ceilidh for the seventh year running, to be held on December 5th 2015 in Kendal Parish Hall. This year we have a three piece horn section consisting of Rose on trumpet, Connie on alto sax, and Debbie on tenor sax. 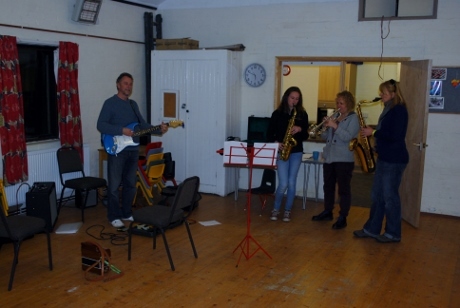 Here they rehearsing in Staveley with Steve. 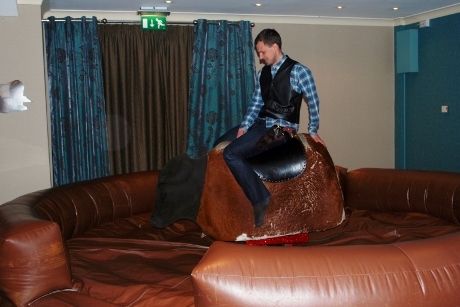 The Castle Green Hotel in Kendal is a regular venue for the band, and after all our summer holidays were over we re-visited it to play for a United Utilities social evening, with the wild west as a theme. 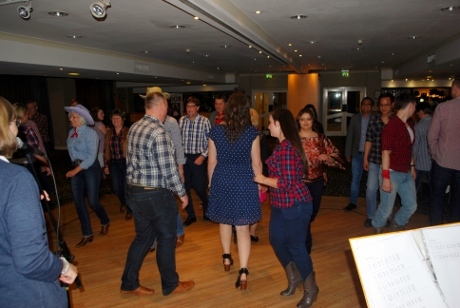 Enthusiasm was well to the fore on both the dance floor and the rodeo! A cowboy enjoying the rodeo, until he gets ejected! The Beer Hall in Staveley has a great atmosphere, and was perfect for the retirement party of Heather and Neil. On a warm and humid evening, a lively evening was enjoyed by an enthusiastic group of friends. 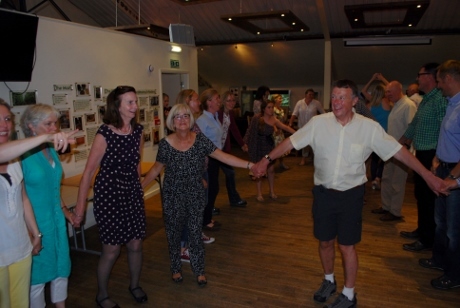 Being in the old county of Westmorland, dancing the Westmorland Square Eight is a must! 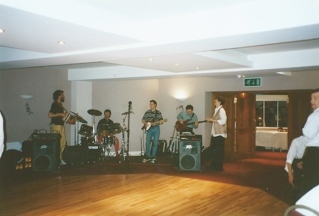 In 1996, we played for the wedding of Jo and David at Whoop Hall, and over the years since Jo has booked us to play at Hest Bank Hall for various functions. This year she booked the band to play for her birthday party, and it was a privilege to help her celebrate. Thanks to Jo and David for booking us again, and all who helped to make it such a great evening. Here is Jo sat centre stage thanking the friends who came to help her celebrate. And the dancing well under way. The band were contacted by Jenny Rose asking if we would help her fund raise for her forthcoming VSO trip to the far east. 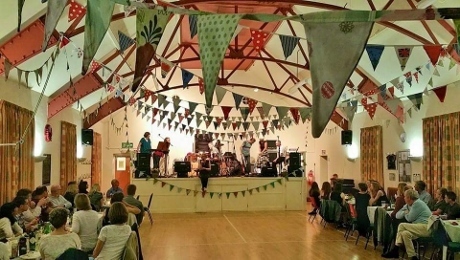 The band were happy to do this and the evening in Ambleside parish hall was a great success. Well done Jenny. We have played three times for the same family over the past few years, once for a wedding anniversary and twice for weddings. 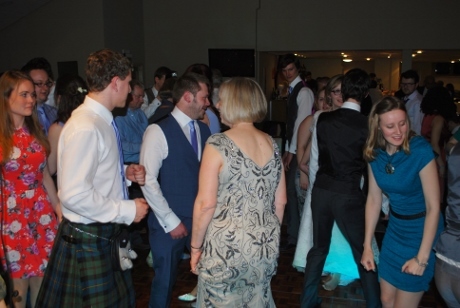 This ceilidh made it four times and also for a wedding, this time between Fiona and James. 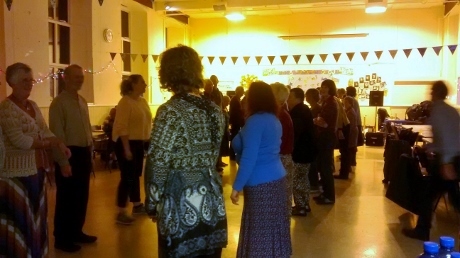 Held in the function room at Cartmel Racecourse where we have played before, the evening was a delight with lovely friendly people and enthusiastic dancers: great stuff! 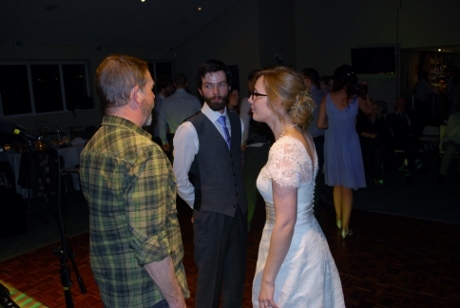 Here are the bride and groom discussing the evening with Les our caller.